That’s over 10 billion pounds… on the low end. And, again, that’s annually. Probably not something were going to counter by making 3D printing filament. In fact, the number is so staggeringly large that scaling up to harvest the plastic already there really isn’t viable economically – at this point, we have to lower the amount of ocean plastic being created to make a dent. That certainly means we’ve got to increase our plastic recycling rates dramatically, but it probably also means we need to reconsider our use of this material at some level… the oceans are literally choking on it. If you haven’t looked at Chris Jordan’s Midway photographs, do so to get a picture of what this kind of pollution looks like. 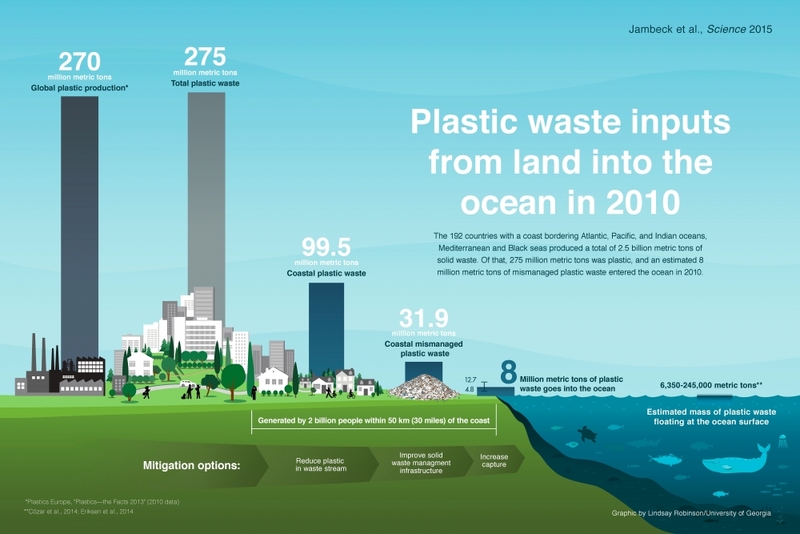 Once you’ve got those images in your head, and digested some of the facts from the infographic above, share your thoughts on how we might begin to address this massive stream of waste.